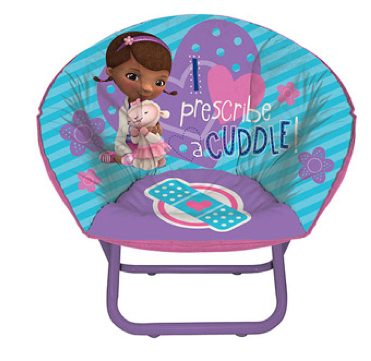 Disney Doc McStuffins Toddler Saucer Chair $15.75 + FREE Store Pick Up (Reg. $19.88)! You are here: Home / Great Deals / Disney Doc McStuffins Toddler Saucer Chair $15.75 + FREE Store Pick Up (Reg. $19.88)! Do you have a little Doc McStuffins fan? Grab this super cute Disney Doc McStuffins Toddler Saucer Chair on ROLLBACK right now for just $15.75 + FREE Store Pick Up (Reg. $19.88)!